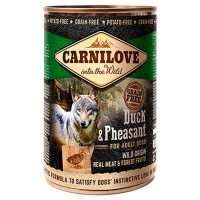 New Carnilove dog food is an ultra-premium grade dog food, using wild-origin meats such as reindeer, duck, pheasant, turkey, lamb and wild boar. 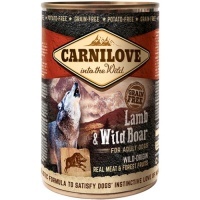 The ingredients mirror the composition of a natural prey diet and ensure an intake of important amino acids. The meats are supplemented with forest fruits, vegetables, wild berries and herbs, which provide important vitamins, antioxidants and other essential nutrients. Carnilove has been formulated with careful consideration for the historical continuity of cohabitation between pets and humans. The ingredients and their proportion have been developed according to the diet of dogs prior to the advent of agriculture, but production is based on the latest processes and technologies. 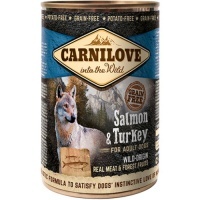 Rated 4.9/5.0 on the independent review site All About Dog Food. 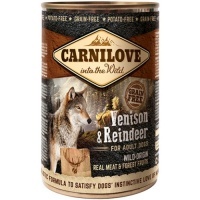 Grain free wet dog food with wild-origin meats.